A coach should help to improve the performance of the players (and the team) both physically and psychologically. The position of coach is demanding and multi-faceted. Parent, teacher, counselor, disciplinarian, organizer...these are some of the duties demanded of the coach. When players sign-up with a club, they expect to receive something for their registration fee. They want to play and learn and they also want to do so in an enjoyable environment. Shaping the lives of young people is a large responsibility, effected not only through what we teach, but also the way we teach. The process of learning is at least as important as the product. In addition to what they learn about soccer, children may learn to be better people. You may be overwhelmed by your influence, but you accept that influence when you assume the position of coach. To develop players, you must have a sound knowledge of the game. This knowledge relates to skill, technique, tactics, fitness, and Laws of the Game. Coaches are, generally, knowledgeable about some of these aspects, but weak in others. Good coaches are always seeking new ideas to develop their knowledge of the game and players. As coaches, we must try to find out what potential a player has so that we can develop that potential and make the player the best player he or she can be. To register to be a coach, read these instructions. 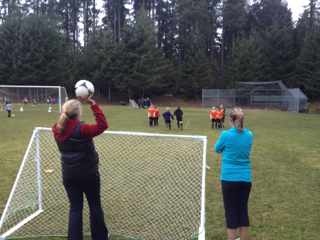 BC Soccer recommends all coaches to obtain soccer training for players at the right stage of their development. As players grow and develop their skills it is important for coaches to be equipped with the right tools at the right time to provide the right environment for players, parents and coaching staff alike. Becoming trained at the right stage and by obtaining the resource material that is available by attending the courses, coaches will be able to impact soccer education in an organized and enjoyable fashion. Every course is progressive and more advanced as the players' ability increases. This chart provides the guidelines for coaches to select the best course for themselves and the players, respective to the stage of development the coach is working with. Coaches need to know that in the early stages, some players may benefit from curriculum that overlaps between various years due to a difference in ability, interest, and growth factors.